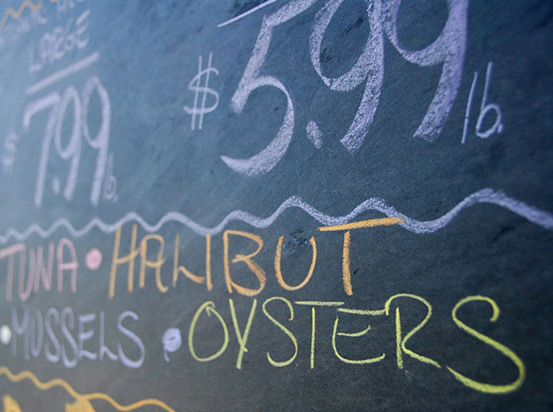 You can't get far in Maine without hearing about an amazing meal sourced from the sea. Although the "sea to table" movement doesn't get as much media attention as the more nationally recognized "farm to table" movement, it serves as the bedrock of coastal communities in the same way farms sustain agricultural strongholds. 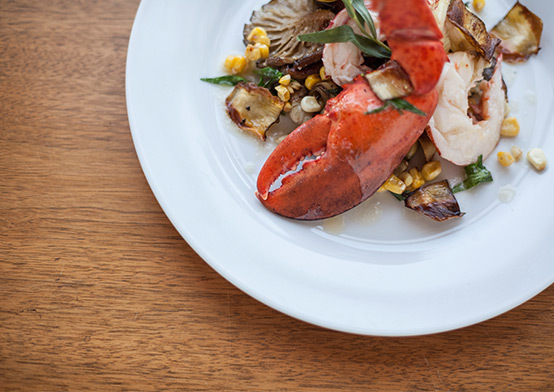 Many Maine restaurants pride themselves on using locally sourced and sustainable ingredients in their daily menus, from lobster caught on the coast to mussels, oysters and kelp farmed in the bays using the marine farming method of aquaculture. 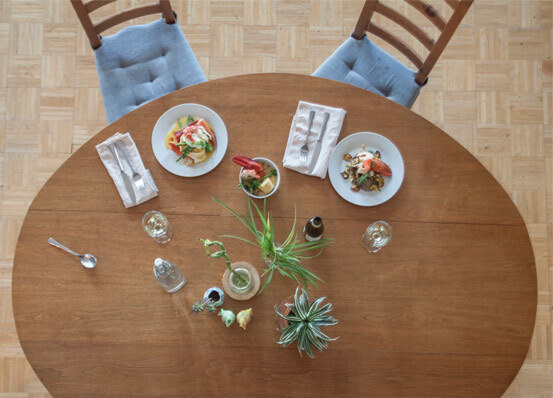 The local food scene in Maine is a major point of state pride and a well-kept national secret—but that's starting to change as word gets out. 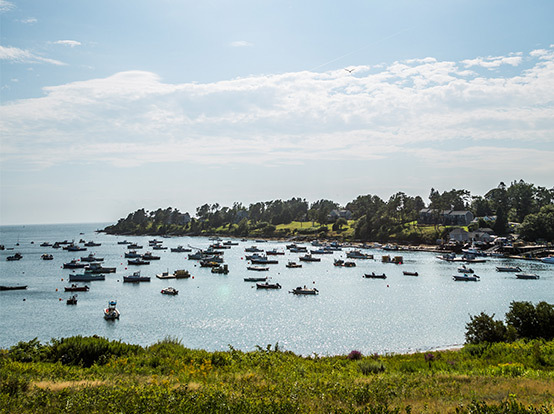 Whether you fanatically follow your favorite food truck, drive up and down Maine's 3,500-mile coastline in hot pursuit of the best lobster shack or go on a tasting tour of Portland's eclectic dining scene, you'll be eating fresh, sustainable and local fish and seafood at every stop along the way. Eating your way through Maine is part of the fun of visiting, and no trip to vacationland is complete without trying all the lobster dishes you possibly can. From fresh-caught lobster ice cream at Ben & Bill's Chocolate Emporium on Main Street in Bar Harbor (yes, ice cream: They craft a butter-based vanilla ice cream and mix in a healthy dose of butter-marinated lobster chunks, to the amazement and delight of patrons) to a quintessentially Maine lobster roll at Red's Eats in Wiscasset, Maine, lobster is celebrated from sea to table throughout the state. The Atlantic Ocean offers a dizzying array of saltwater fish and shellfish for Maine commercial fishermen to catch and sell to locals and tourists, as well as nationally. Back in the 1800s, the practice of aquaculture was developed in Maine as a way to help restore overfished cod and lobster populations. The methods developed were eventually used to farm marine life and sea vegetables in controlled habitats. Maine is now one of the leading producers of farm raised marine seafood in the country. Broadly speaking, aquaculture (and its subset, mariculture, which is aquaculture practiced in marine environments and underwater habitats) is akin to agriculture, while commercial fisheries offer the marine equivalent of hunting and gathering. Both activities help maintain Maine's maritime heritage and support diverse and vibrant working waterfronts in Maine's coastal communities. In Maine, aquafarmers cultivate oysters, mussels, clams, scallops and salmon, plus vegetation such as seaweed and kelp. Raised in submerged contained habitats, the farmed shellfish, finfish and sea vegetables are easily protected, monitored and eventually harvested to be sold both in Maine and nationally, boosting Maine's economy and strengthening the aquatic ecosystem. The Maine Aquaculture Association is a group of aquatic farmers devoted to developing innovative aquaculture techniques as well as focusing on sustainability and environmental responsibility. The animals and plants grown by these ocean pioneers rely on Maine's clean water and healthy marine ecosystems to grow high quality, healthy seafood. The aquafarmers of Maine are fierce protectors of their vast ocean fields. Given that aquaculture in Maine is the coastal response to the traditional agriculture sector dominant throughout the American heartland, their harvests must be celebrated with the same pride. Fresh-caught fish markets, front-and-center placement in local restaurants and local "Sea"SAs are some of the ways in which Mainers celebrate their vast natural resource. In Maine, local fishermen provide the maritime equivalent to the nationally popular farmer's CSA (Community Supported Agriculture), complete with a subscription model, convenient pick-up locations throughout the state and just-caught seafood practically delivered to your door. Amber Lofthouse of Portland, Maine, is a proud customer and overall enthusiast of her local fish and seafood co-op, Salt + Sea. Salt + Sea is family owned and managed and "works to honor the fishermen's stewardship of the ocean and their efforts to preserve the resource for generations to come, offer[ing] the most plentiful and healthy fish stocks, and striv[ing] to protect the watershed from pollutant runoff." Highlighting the program's similarity to a traditional agricultural CSA, Amber and her family refer to their subscription as a CSF (Community Supported Fishery). As a member of Salt + Sea, Amber receives one pound of fish fillets per week at the affordable rate of $12/lb. Salt + Sea also offers their customers the option of receiving a shellfish share (read: LOBSTER) or a combination fish-and-shellfish share. The CSF posts that week's catch of sustainably fished stocks (all native to the Gulf of Maine) to their website and sends out a weekly email to their subscribers outlining the day's catch, which ship caught the fish and seafood and where in the Gulf of Maine it was caught, plus the ship captain's name. Amber recalls one week of particularly bad weather when Salt + Sea sent out an email describing the turbulent sea conditions and challenging working conditions for the fishermen, saying that it "wasn't something I had thought about and really made me appreciate the fish that much more." Every great food town has to have a spirited debate on the preparation of its local specialty, complete with fierce competition and multiple claims of being the original inventor. Philly has its cheesesteak battles, New Orleans stages regular jambalaya and gumbo cook-offs, and the turf-war over who has the best Chicago hot dog is not without its share of bloodshed (or maybe that's just ketchup). Perhaps due to the ubiquity of the lobster along the coast, the entire state of Maine participates in the great lobster roll debate. It's safe to say that some aspects of the classic Maine lobster roll are agreed upon between dueling lobster forces. For one, the bread must be worthy of the succulently fresh lobster meat, and that means a freshly baked New England-style (aka split-top) bun with flat, crustless sides born to be buttered and grilled. Grilling the lobster roll bun invites flawless juxtaposition between the cold chunks of lobster and the warm buttery lobster receptacle. Another time-honored ground rule that you must obey to be a contender in the Maine lobster roll wars is the strict prohibition of shredding the lobster—it absolutely must be divided into chunks, lest you risk devaluing the lobster roll to the level of the lowly tuna salad. Most in Maine agree that a lobster roll should be lightly dressed in mayonnaise, but there are pockets of drawn butter aficionados throughout the state as well as those stubborn strongholds of minimalist-devotees who live and die by the notion that the meat of a true lobster roll must be served unadulterated. The lobster roll's origin story in Maine is as hotly contended as the recipe itself. Some say that Harry Perry first offered lobster rolls out of his Milford, Connecticut, restaurant in the 1920s; others claim the Nautilus Tea Room in Marblehead, Massachusetts, as the original purveyor of lobster rolls, while many Mainers view Bayley's Lobster Pound at Pine Point as the inventor of the famous seafood sandwich.i The true original lobster roll may have been lost to the annals of Maine history, but the entire state salutes its legacy by offering more versions of lobster rolls than the first sandwich inventor could have possibly imagined. A lobster is a lobster, right? Classic tourist mistake. 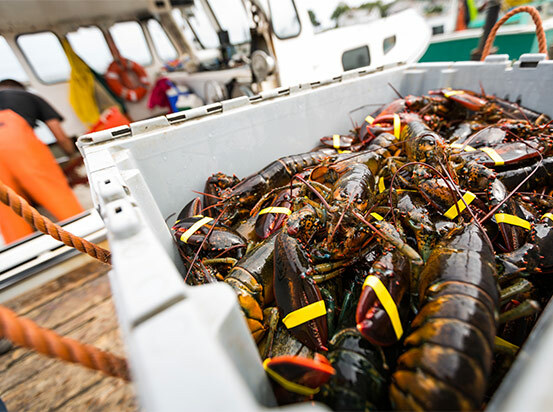 Every Mainer worth his or her (sea) salt has a preference between soft-shell and hard-shell lobster. Soft-shell lobsters are the result of the lobster's potentially long lifespan: Lobsters outgrow their shells and molt, resulting in a temporarily softened shell. Molting season occurs during the summer months for lobsters in Maine and marks a period of glee and revelry for soft-shell lovers throughout the state. When a Maine lobster sheds its old, hardened shell, its new shell is bigger than necessary, giving the lobster room to grow (cue flashbacks to your new too-big boots in elementary school). The lobster actually shrinks (shedding mostly water weight) in order to wiggle out of its tight-fitting hard-shell. Those who fall into the hard-shell camp cite the abundance of meat housed within their lobster of choice (approximately four to five ounces of meat for a one-pound hard-shell lobster versus two to three ounces of meat in a one-pound soft-shell lobster), but soft-shell enthusiasts will counter that their meat of choice is less waterlogged than the bloated hard-shell lobster. Soft-shell lobster fans will tell you that hard-shell lobsters are much more difficult to crack open, making meat removal a major headache, while their favored soft-shelled crustaceans require a pared-down arsenal of tools: bare hands only. If you're basing your judgments on taste rather than preparation, both lobsters have unique characteristics. 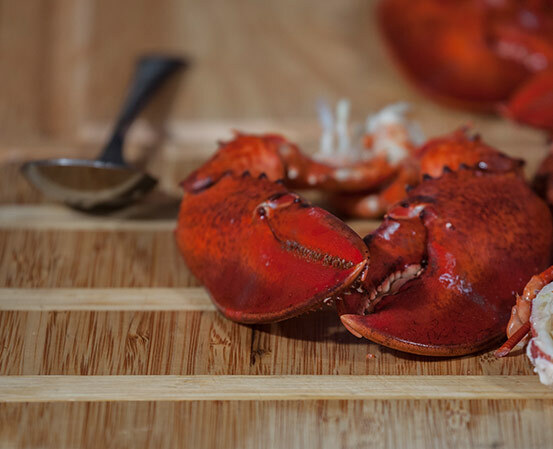 Hard-shell lobsters have a denser texture, with briny flesh that evokes the sea (makes sense, as the flavor molecules are permeated with saltwater), while soft-shell lobsters are slightly sweeter with a more tender texture. A true soft-shell lobster devotee doesn't mind spending more per pound on a (to their mind) superior product, while hard-shell enthusiasts contend that their lobster of choice offers more buck-per-shuck and comparable taste. So we've covered the bread and the meat, but what about the fixin's? Almost everyone can agree that when it comes to lobster rolls, less is truly more. However, some outliers argue that a Maine lobster roll is incomplete without a sprinkling of diced celery; other dissenters swear by a dusting of smoked paprika. A brave few push the traditional boundaries of the lobster roll, adding elements of Asian fusion or experimenting with new bun options–as tasted at Tasting Table's 2013 Lobster Roll Rumble, held in New York City, where four native Maine restaurants battled among others for title of "America's Best Lobster Roll." But be warned: When changing an iconic Maine food, tread lightly. Don't you know there's a war going on? You've come to Maine, you've polled all the locals on their favorite spot for fresh lobster, and now it's time to dig in. But how? Actually sitting down and eating a lobster can be intimidating. It is, after all, the layman's last remaining vestige of primal eating, because lobster meat spoils easily and is best cooked alive. Looking at the boiled-red crustacean, you may ask yourself, "Where do I even start?" and "Why would I eat something that requires a plastic bib?" and possibly "What have I gotten myself into?" Rest assured, as soon as you dig into the oh-so-delectable lobster, you'll be grateful for that bib, cartoon lobster included. In fact, start with a bib. Think of it as your good friend, who protects you from lobster bits and stray sauce splashes. Lobsters can be slippery, especially when dipped in butter. Be prepared to use your hands. A big part of the lobster experience is tactile—just ask any seasoned lobster-eater. If you're eating a soft-shell lobster, use your hands to crack open the lobster and dig the meat out. If your lunch is encased in a hard-shell, break out the specialized tools. True card-carrying Maine lobster-pros travel with their own cracker, mallet and gloves for handling so they're always prepared to eat a Maine lobster. Tools will vary by eatery, but the most popular lobster utensils are the claw cracker and the lobster fork. Think of the claw cracker like a nutcracker. It's meant to split the tough shell open, so you can access the delicious meat inside. The lobster fork is like the triton of the lobster meal. Use it to dig inside crevices and hard-to-reach areas so you can devour every last briny morsel. Getting up close and personal with your meal is a vital element of the Maine experience. Peek into any restaurant or stroll by any shack and you'll see that grabbing a lobster, cracking it open and savoring the rich flavors is a required Maine activity. The Atlantic Ocean provides the people of Maine with sustenance, recreation and hard-earned livelihoods steeped in sweat and salt water. The Maine tradition of eating only fresh and local fish and seafood has its origins in necessity but has since stood the test of time, remaining a vital aspect of life on the coast. Why? Because once you've tasted fish that was just plucked from the sea, you'll never be able to go back to factory-farmed or even store-bought fillets. Because purchasing fish and seafood caught by your neighbor brings vitality and strength to your entire community. And because knowing where your food comes from is an empowering feeling that's hard to discount. 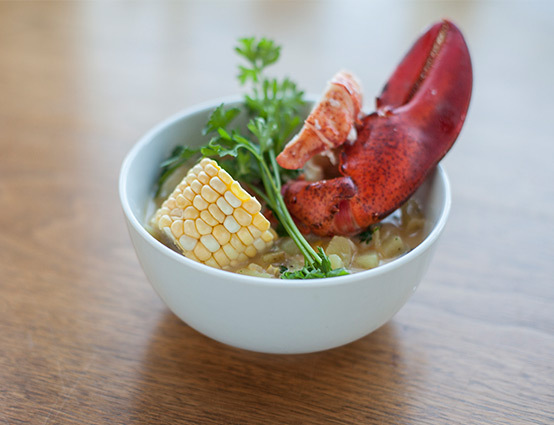 From the bobbing lobster buoys dotting the Maine coast to the chefs basing their menus on what came in off the dock that day, the sea-to-table movement is thriving in Maine. Ready to try your hand at cooking with Maine lobster? Read on for recipes that showcase our favorite crustacean. 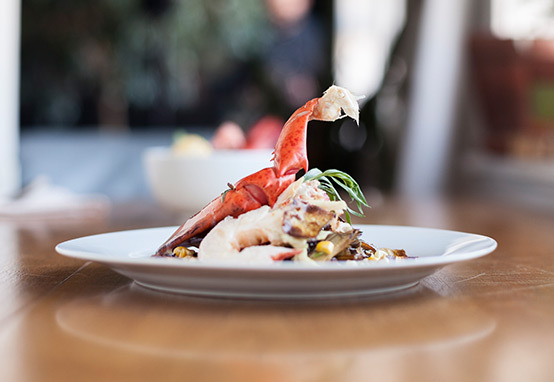 Aside from being low in fat and packed with protein and amino acids, lobster is incredibly versatile. Throw this savory ingredient into any dish, and you've got a delicious "Maine" course. Boil Maine lobsters in heavily salted water. Cook 10 minutes, remove, pick Maine lobster meat and reserve shells. Sauté onions, bacon and pancetta until golden brown with a translucent texture. Add picked Maine lobster meat, parsley and spices; deglaze with sherry and remove from heat. In a separate pot, boil potatoes in heavily salted water. When al dente, remove potatoes, saving 4 ounces of water. Let potatoes cool and, in the same pot, add heavy cream, creamed corn, evaporated milk and salted water. Place on medium heat. Husk corn and lightly salt, pepper and butter. Roll each ear on a hot grill, moving constantly to avoid burning. Remove from heat and, with a sharp knife, carefully remove kernels and as much liquid as possible. Add corn, bacon, onions, Maine lobster meat and shells to liquid. Bring to internal temperature of 165 degrees, remove from heat and discard shells. Add potatoes and serve. 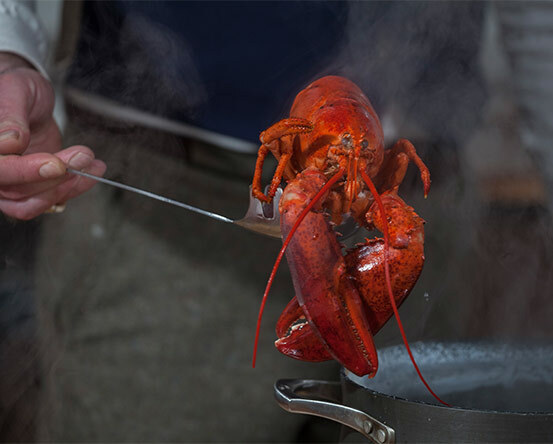 Boil lobster in salted water—7 minutes for the claws, 3 minutes for the tail—and shock in ice water. Take lobster out of shell and place claws and tail in 10 ounces of butter. Chop tarragon and fold in 4 ounces of butter and set aside. Sauté shallot in 2 ounces of butter, add corn stock and reduce by half. Add corn, chopped artichoke and knuckle meat and 1/2 lemon juice. Season with salt and pepper. Grill lobster mushrooms and set in lobster butter. Gently warm up butter to heat the lobster meat. Place ragout in middle of the plate. Take lobster mushrooms out of butter and season with salt and pepper and remaining lemon juice. Place lobster and lobster mushrooms over ragout. Spoon tarragon butter around lobster and ragout. Garnish with artichoke chips, micro arugula and bail flowers. To prepare the Hollandaise sauce: Melt the butter in a double-boiler on top of the stove. In a small bowl, whisk together the egg yolks, lemon juice, and cayenne pepper. When the butter has melted, whisk the egg mixture into the melted butter, stirring constantly and cooking until the sauce starts to thicken. Season to taste with sea salt. Remove the double-boiler from the heat and keep the sauce warm over the hot water. 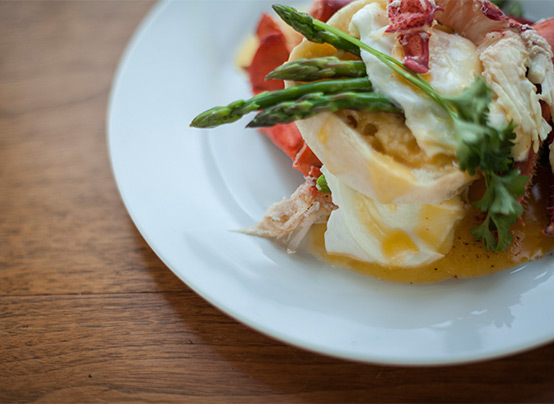 To assemble Maine lobster Benedict: Toast the English muffins and place 2 halves on a plate. Cut the steamed asparagus spears in half, and place 3 half-pieces on each English muffin half. Sauté the Maine lobster in 1 tablespoon of butter until it is heated, and then portion on top of the English muffins. Top each muffin half with a poached egg, and dollop the Hollandaise sauce on top. i. Wright, Virginia: The Maine Lobster Book. Camden, Me. : Down East, 2012. Print.